Gordon: [shouting very loud] GET ME SPECIAL AGENT CHESTER DESMOND OUT IN FARGO, NORTH DAKOTA! Lucy in the sheriff station discussing racoons with Sheriff Truman And some scenes from the theatrical version were extended, with more dialogues. Q: Why does Gordon need to commuicate with Desmond through Lil's code? Q: Why is Dale Cooper such a small part of the film? Q: What is garmonbozia? And what is a formica table? This was one of the most critically panned movies of the decade, but only because the world's film critics are too full of their own self-importance to bother watching a masterful TV series like Twin Peaks. All Twin Peaks fans know that this movie is monumental enough to transcend criticism, sure it makes no sense to those who have never seen the TV series, but those people have never lived anyway. 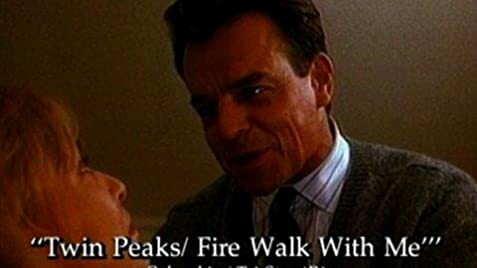 Twin Peaks: FWWM, brings a genuine sense of tragic martyrdom to the death of Laura Palmer, as well as being one of the scariest, most surreal and atmospheric movies ever made. Never seen Twin Peaks? Watch the TV series on video first, and then see this incredible prequel.